The “Urban Maeztro” at work. When you think of masked crusaders, you don’t generally think of spirited souls galloping around under the cover of darkness, plastering the walls of the city with impromptu works of art. But, that’s exactly what’s happening in Tegucigalpa, Honduras. A man known only as “Urban Maeztro,” or “Urban Master,” takes only minutes to plaster his message onto a wall and then, he’s gone. 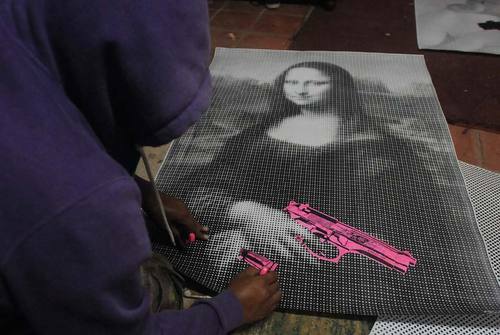 In one location, he plastered a giant black-and-white reproduction of Leonardo da Vinci’s “Mona Lisa” wielding a pink pistol. In another, he slapped an image of Rene Magritte’s “Son of Man,” onto a wall of one of the city’s most elegant hotels, substituting a grenade for the apple covering the face of the suited subject in a bowler hat. There’s meaning in the mayhem. Tegucigalpa is the most violent city in the entire Western Hemisphere – with 1,149 murders in 2011, or 87 for every 100,000 – and one of the most violent in the world. It’s a sadly ironic situation; considering Honduras – like most of Central America – was in the grip of so much civil unrest throughout much of the past 50 years. That terror has become embedded in the city’s fabric. The population of 1.2 million lives in a perpetual state of fear; burdened even further by poverty and a fragile government. He attracts the attention of passing viewers by defacing posters of artistic masterpieces with guns, grenades and other tools of violence. He also employs more traditional graffiti, such as painting sections of metal light poles to look like bullets. “There is a parallel between the brutal violation of a work so beautiful by adding a firearm and the violence and guns in Tegucigalpa, which could also be a beautiful city without them,” he says. He said the catalyst for his mission came when he entered a UNESCO poster contest on cultural diversity. When he lost the contest, he decided that the institutional doors for supporting his idea were closed. “The natural place for art is the street, forget the middleman,” he says. Since then he’s created a dynamic that includes making his own glue by boiling wheat and water, which he said is “the best adhesive and cheap,” and roaming the city on Sunday afternoons seeking vacant walls and inspiration. His accomplice, the documentarian Junior Alvarez, keeps watch while he works, then photographs the final piece. His work his danger and illegal, especially in a country that experienced yet another coup just three years and where many citizens believe the police and the military work in concert to foment the violence and keep the populace in check with fear. During another artistic assault, a security guard watched as the Urban Maeztro plastered Grant Wood’s “American Gothic” on a wall in front of the National University. “Who pays you to do that?” the guard asked. “No one,” the artist answered. “To help you think.” And then, he was gone. Sometimes, that’s what people need to do – think about their environment and their world and how they can change it for the better.